In urban environments, studies show up to 40 percent of the distance travelled being caused by people who are searching for a parking spot. A huge share of public space in cities is reserved for parking. FOKUS is working on multiple dimensions in the domain of parking and provides solutions for operators of parking garages, services to vehicle drivers to help finding a proper parking space in time as well as for cities who wish to reorganize parking in the urban area. Our sophisticated algorithms can detect vehicles of multiple categories in all weather conditions and compute free parking spaces – just using existing surveillance cameras. This information is given to drivers in need of a parking spot and to operators. 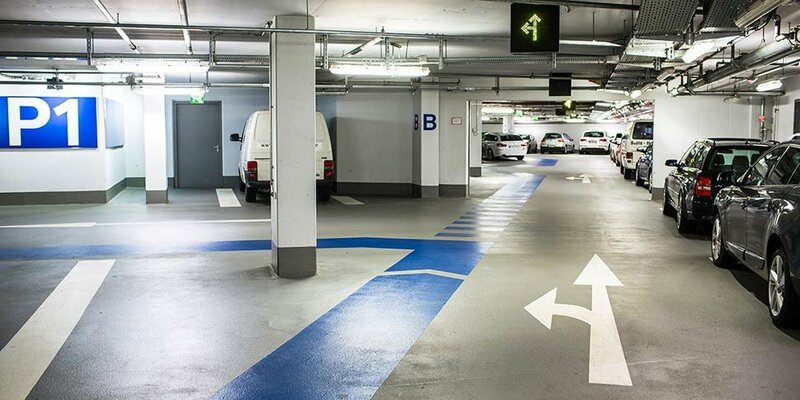 The system can be adapted to any outdoor and indoor environment as well as to non-public parking locations such as company parking lots, bus depots or exhibition areas. The Fraunhofer FOKUS Intelligent Parking Garage utilizes off-the-shelf cameras and sophisticated computer vision to monitor the occupancy of parking lots as well as the movement of vehicles and persons inside a garage. This information is used to provide drivers with seamless turn-by-turn navigation to their parking spot – even in areas without GPS reception! Without any necessary action by the driver, the vehicle registers itself at the garage, downloads high-precision local maps and switches to external localization provided by the garage. An intelligent link to garage infrastructure and access control gets rid of the parking tickets and payment machines. A minute-precise virtual parking ticket is created and full cost transparency is given to garage users. Interfaces are possible both to vehicle-internal systems as well as to today's smartphones. The high precision localization even allows for integration into tomorrow's automated vehicles – letting the car park itself! The penetration of GPS receivers in mobile devices has enabled a growing field of location based services for navigation and guidance, social networks, sport, health and security. Generally though, people spend most of their time indoors where the satellite reception is too low for high-precision localization. Fraunhofer has developed an integrated solution for high-precision indoor localization using an array of state-of-the-art sensors combined in sophisticated algorithms. A variety of localization techniques like WLAN fingerprinting, RFID and Radio tokens, camera or antenna array based systems exist and are used. One new promising approach is the localization by ambient magnetic fields. The idea is simple: the steel structures in our buildings modify the earth magnetic field in a unique recognizable way. Today every smartphone has a magnetic sensor which we can use to measure a magnetic map of the building. To find our current location we measure the magnetic field at the place and search for its pattern in the magnetic floor map. The research project at FOKUS is developing and evaluating different probabilistic algorithms like Markow chains, Bayes or Particle filter extended by sensor fusion with other methods like Inertial Measurement Units, RFID or camera based systems. The results will be applied in the project M4Guide for guiding the blind and visually impaired persons.